If you want more information on this attractive study program, the renowned University of Wrocław, the vibrant city of Wrocław and the exciting student life, please visit our webpage here. 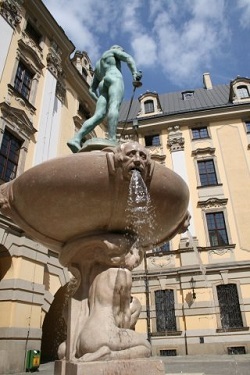 The University of Wrocław has a rich history of more than three centuries. Founded by Leopold I Habsburg the university evolved from a modest school run by Jesuits into one of the biggest academic institutions in Poland. At the beginning of the 19th century, the university had five Faculties: philosophy, Catholic theology, evangelical theology, law, and medicine. Later it was expanded by numerous sections, laboratories and a natural museum, which exists until today. Today, the first and foremost focus of The University of Wrocław is scientific research. Our scholars have numerous links with their fellow researchers from other higher education institutions in Poland and throughout the world. The success of our researchers has been recently recognized by Polish authorities, who significantly increased funding for both equipment and research at our University by 80% compared to previous years. The Academic Incubator of Entrepreneurship is a new unit of the University of Wrocław designed to aid students in starting their own businesses by providing free entrepreneurial advice, organizing conferences, seminars, subsidizing selected investments and offering office space. The Academic Incubator of Entrepreneurship cooperates with the Wrocław Technology Park, a technological center with laboratories, office space, conference center and modern multimedia equipment. The objective of the Technology Park is to create conditions for the use of the scientific and industrial potential of Wrocław and the region and to stimulate the advanced technologies industry. The University of Wrocław is proud to be one of its shareholders. Today the University of Wrocław is the largest university in the region and teaches over 40,000 students and around 1300 doctoral students at 10 Faculties. 9000 students graduate from the University every year. Cambridge University English and European Law Course.